"...over the past, you know, 27 months we’ve created 4.5 million private sector jobs. That’s more jobs than in the Bush recovery, in the Reagan recovery..."
It's no surprise that the Obama reelection team would want to spin job numbers to make the Obama record look less horrible, but using their own method, they still come out behind not only Ronald Reagan but George W. Bush, too. What Obama likes to do is count jobs "created" from the deepest depth of the recession. But that's not how we count recovery from a recession -- we say we've recovered when we've recovered up to the previous high point. As the collapse was still occurring when Obama took office, there was still further to fall, so Obama likes to pretend that any jobs above the lowest-of-the-low are jobs he "created." At this point in time, Obama still hasn't "created" a single net new job. His job figures remain negative, except when you play games as far as your start period for counting them. Both Bush and Reagan added new jobs on top of the previous high-water mark for employment. Reagan's expansion was fueled by millions and millions of such jobs. Obama has yet to even get back to zero. Go check out the entire post. There are some nice graphics there showing all of this. And, indeed, while sharp recessions can often produce some of the most rapid and robust recoveries, we've instead settled into a stunted "new normal." Seriously, check out the larger version of the above graphic by just clicking on it (or click here). And read the whole thing over at AEI. So the takeaway here is that even if we use the contorted standard Team Obama is peddling, his record still looks pathetic. And if we apply just normal standards, it looks even worse. Previous Trivia Tidbit: Obama's Good Economic News Always Seems To Be Revised Down Later. This was a test right? 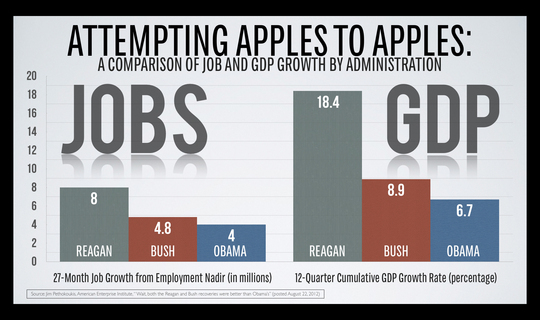 To see how much BS we could listen to before we got to some facts about unemployment and jobs. Yeah, hard to even listen to that. But this is what they're out there trying to sell. And some people are willing to believe it.